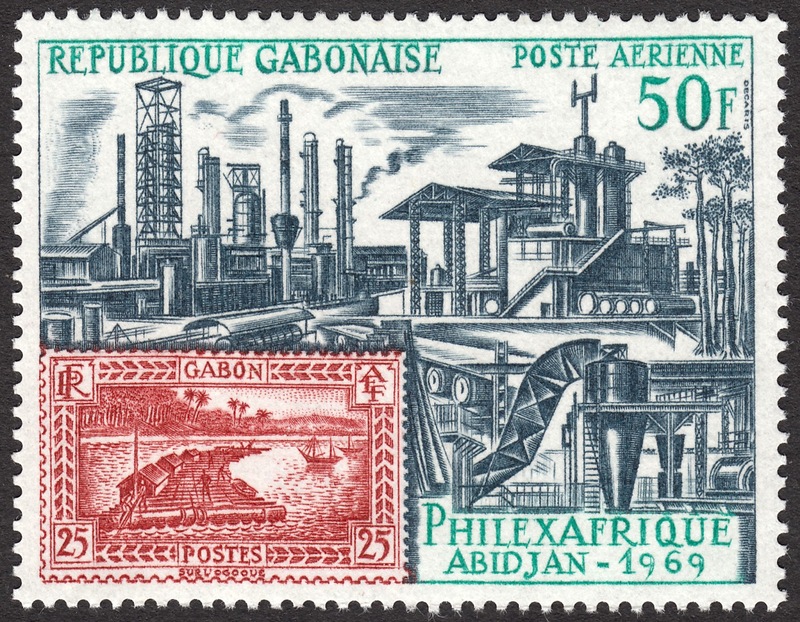 In 1969 the city of Abidjan hosted the 2nd Philex-Afrique. Abidjan is the capital of Ivory Coast. The construction of a new wharf in 1931 gave the city a huge kickstart. So much so that by 1933 it was designated the capital of the then French colony. Incidentally, Abidjan is considered one of the most populous French speaking cities in Africa. On 14 February 1969 Philex-Afrique was officially opened. To celebrate the event an omnibus series of stamps was issued in 14 African countries with a continued affiliation with France as either an colony or former colony. Unlike most omnibus issues which exhibit the same design, this issue had a different design for each country. 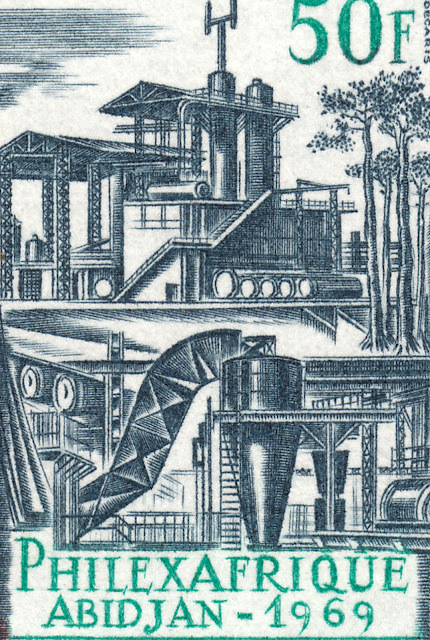 And the format was an interesting stamp on stamp design. Each country's design features a fresh new stamp design complimented by a reproduction of of an old stamp placed in one of its four corners. One of these countries was Gabon. 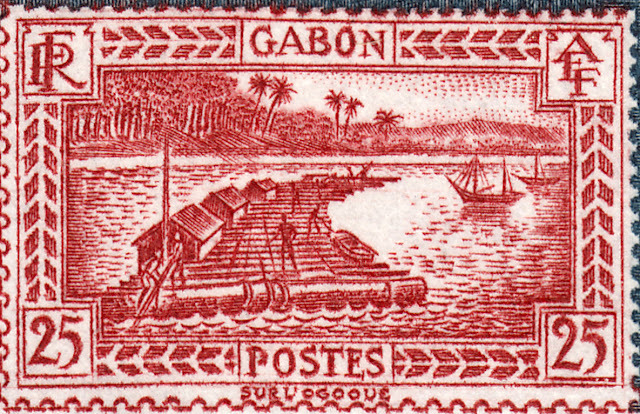 Gabon can be found on the west coast of Central Africa. Gabon gained independence from France in 1960. 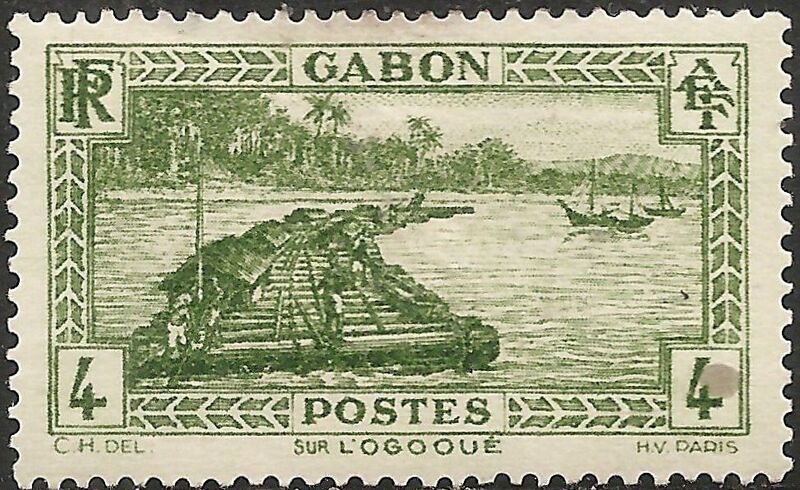 The Gabon stamp was designed and engraved by Albert Decaris. This stunning stamp design pays homage to Gabon's primary economies over time. The 1933 stamp at bottom left illustrates Gabon's first primary industry of logging. Decaris has beautifully reproduced this lovely classic stamp. See below for an example of the original stamp along with an enlarged version of Decaris' reproduction. The main portion of the stamp illustrates Gabon's current primary industry. Oil. Oil represents 43% of Gabon's Gross Domestic Product (GDP). Decaris has done a superb job here making modern machinery eye-caching and appealing.